The Haier V6200 is a 1.3 megapixel camera phone weighing just 95 grams, and with looks that make the V6200 a distinctly different handset. It's not just a great phone for taking photos though - the V6200 comes with twin stereo speakers for maximum enjoyment. At time of publication, we believe that the V6200 has 64Mb of available internal memory for storing sound and picture files, capable of storing up to 30 minutes of video recording. There's a flasg on the camera to help with night shots, and the V6200 comes with a "multi-picture" function, which is exclusive to Haier. The primary display on the Haier is a 128x160 pixel resolution TFT unit in 262,000 colours, plus a smaller sub-display of 96x96 pixels in 65,000 colours. There are some unusual features on the V6200, including a privacy and SMS firewall and 3D surround sound, along with some clever camera features. A little more down-to-earth is the support for Java and GPRS, plus the Haier V6200 sports a WAP 1.2 web browser. 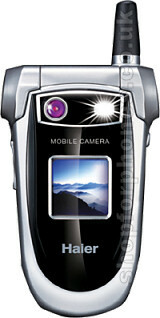 The V6200 has about 3-4 hours talktime and around 5 days standby time, and measures 86x48x22mm. Expected to be available in the UK during the first half of 2005. Please subscribe to our newsletter for updates. If you want more information on the Haier V6200, subscribe to our mailing list. Also, the Update newsletter contains general news about new phone releases.